And the star of the Daring Baker's Challenge this month is Chocolate! And you may ask how this cake is held together? With the help of its supporting ingredients – Take a bow butter and eggs! 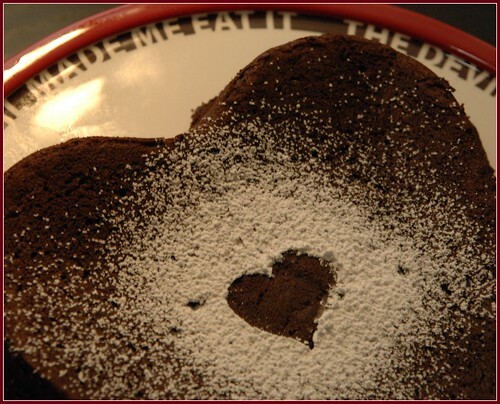 Chocolate Valentino is a very simple cake to make but it is very rich – 1 pound of chocolate! This is why it is soooooo important to use good chocolate because the finished cake will taste exactly like the chocolate you use. You will want to serve this chocolate cake in smaller pieces, as that is all you need to satisfy your chocolate cravings. If you would like a more fluffy cake with icing then try my mom’s (Sadie’s) chocolate cake. Dan still prefers that one! 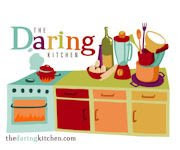 I would like to say thank you to this month's hosts of The Daring Bakers challenge. The February 2009 challenge is hosted by Wendy of WMPE's blog and Dharm of Dad ~ Baker & Chef. They have chosen a Chocolate Valentino cake by Chef Wan; a Vanilla Ice Cream recipe from Dharm and a Vanilla Ice Cream recipe from Wendy as the challenge. You can find the ice cream recipes on the above blogs but I decided to make a Lavender Honey Ice cream. When I vacationed in France this past June, I visited the Lavender Museum and picked up some Lavender tea. 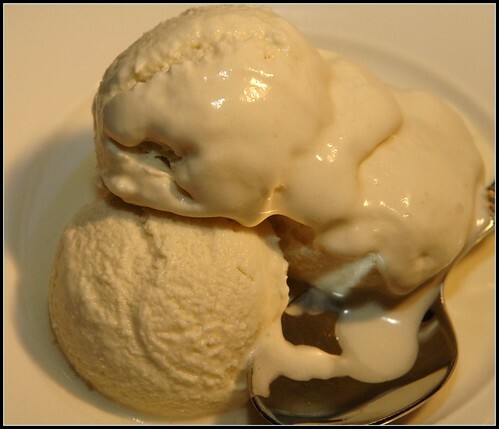 I have been waiting to make some ice cream with it so I have included the recipe here. By the time I figured out the camera, it had started melting, but it was very good and quite fragrant. In the top of a double boiler, heat the half-and-half and lavender over simmering water until steaming. Remove from the heat and steep for 10 minutes. In a bowl, whisk the egg yolks until blended, then whisk in the honey. Whisk in about half of the hot half-and-half then pour the yolk mixture into the pan of half-and –half. Sir and cook over simmering water until the custard coats the back of a silicone spoon or spatula, about 10 minutes. Immediately place the custard pan in the ice bath and stir the custard occasionally until it cools to room temperature. 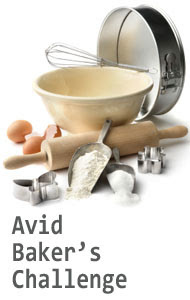 Strain the custard into a container and discard the lavender. Stir in the cream, cover, and refrigerate until thoroughly chilled, about 3 hours. Your Valentino is beautiful, I was rather uninspired by this challange. This month will be better nutritionally, can't wait to get started!!! !